Ambition, innovation and determination was swirling in the air all over the Kentwood Community Center on April 16. 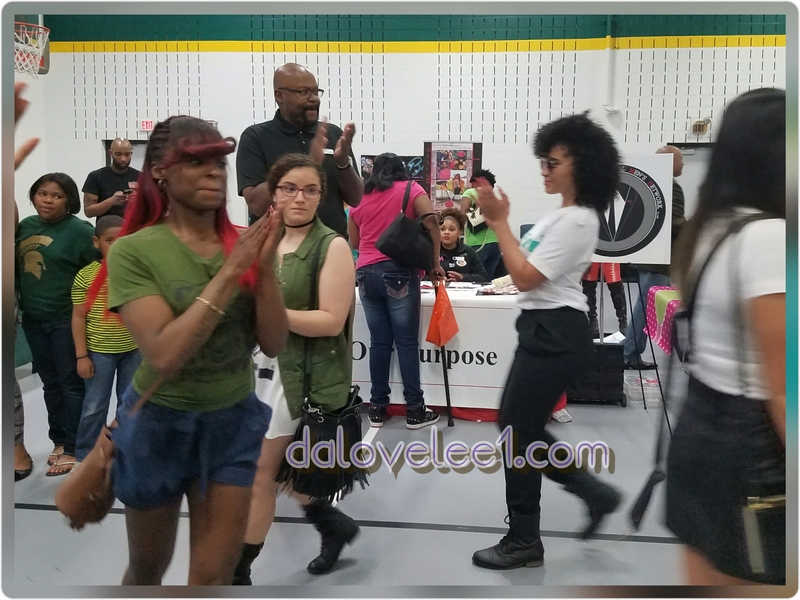 The 2016 Dream Big Fair presented by the Dream Big Sister Circle packed the all purpose-room with more than 35 black business owners, a live DJ, several local models, and a couple hundred beautiful, black consumers, all seeking to obtain creative, quality, black-owned products and services. There was every kind of business you can think of and some I never would’ve thought of there. I’m serious! I expected the hair and beauty products, the jewelry, the clothes, the food and the graphic design services; but I was blown back at some of the other businesses that were there. There is so much talent in the greater Grand Rapids community and it was showcased very well. However, I have come to expect nothing less from events by Della Marie Levi, Founder of the Dream Big Sister Circle. What I liked the most about the fair beside the positive climate that is generated when black folks come to love and support one another, was that this event in particular sparked motivation and inspiration. Most vendors weren’t just trying to sell their goods. They also shared their success stories. They asked visitors about their aspirations and provided advice in addition to promoting their business.They invited us to upcoming events and meetings. They also provided information about volunteer and mentoring opportunities. It was very informative. It was impressed with all of the ingenuity and creativity of many of the business concepts. There was a young lady who created planners and notebooks. Have you ever thought about doing something like that? I haven’t. Another sistah provides cocktail services. There were quilts, custom bags, and pet rocks for sale. There were even a couple of authors in the house. I wish I could write about all of the businesses and organizations but that would be impossible so I’m going to hit up a few that really left a strong impression on me. First up is the Centralian Shop, Unlimited, a screen printing and embroidery company located at 1258 Madision Ave SE, Grand Rapids, MI. I got a smooth little deal on two hot natural hair tees that I’m going to rock hard on the weekends. I was immediately attracted to the unique designs on the shirts. The art on the natural girl prints are really unique and have flair. I’m rocking one now and it’s a perfect curlie girl uniform, if I do say so myself. I’m gonna have to consult the Chief Stitchologist Valencia Cooper very soon about a venture I have in mind. The best presentation was clearly Asia Cosom’s Paradise On Earth. This company provides a line of hair and beauty products that I’m going to try. Naturally, what caught my attention were the classy black and gold t-shirts and jeans that the owner and business representatives wore. Of course, these gorgeous divas were coordinated with the product that was packaged with lovely black and gold bottles. Paradise On Earth has a mask and hair growth oil. I can’t wait to see what it does for my hair. Check out the Paradise On Earth Facebook page to see some testimonies. Tonic Dreams, LLC. was another hit for me. Director-Owner Shawna Box is living the dream. She specializes in bar-tending services for any event. You know how you want to sample everything on the table but you don’t wanna look greedy. Yes, this is the booth that had me under its spell. Jello shots, shot tubes, frozen drinks, infused fruit… and all of it was non-alcoholic. I would LOVE to sample the alcoholic drinks. If I decide to have my 40th birthday party in GR, I’m definitely using this company. There were quite a few jewelers featured at the fair. There were some beautiful displays. I want to give shout out to Tarona Guy who is a consultant for Traci Lynn Jewelry (and is also the Travel Diva if ya got some where ya wanna go). I loved the pieces that were brilliantly displayed. I’ve had a jewelry party before but I didn’t know there was a large, black-owned company that offered consultant opportunities. What’s more, the precious pieces were contemporary and affordable. I like. Mosby’s Popcorn Palace was in the house. I’m really excited about this place because it’s close to me. My family loves popcorn and this company is black-owned. The popcorn flavors are unbelievable. Loaded baked potato, buffalo ranch, mac ‘n cheese are just a few of the flavors on the menu. They understand the struggle and under offer 50/50 fundraisers for non-profits. Go check them out at 6155 Kalamazoo Ave. SE, Kentwood, MI. The Bare All Clothing fashion show was a lot of fun. All of the models were from around the way (local) and that seemed to energized those that lined the runway. The diverse array of skin tones, body types, and swaggology (I made that up) was great for demonstrating different ways to rock each piece. I think the designer does an incredible job creating fashions that Michigan natives can rock with pride. The Grand Rapids t-shirts and sweatshirts are dope and seem to be popular. These clothes are cool for the young and middle-aged urban trendsetters. There are tanks, hoodies, tees, dresses, pants and more. I took a lot of pics so check them out. Finally, I want to shout out Erica from New ERA Jewelry. It was pleasure talking to this trailblazing entrepreneur. Her hand-crafted jewelry was blinging. While she doesn’t have a physical store, these gorgeous fashion jewels can be found on Etsy or by throwing/attending one of her jewelry parties. I was fascinated by the quality of work; but more impressive was how she chose the name for her business. It’s not my place to tell but I’m sure she’ll share if you ask her. All I know is, a girls’ night out filled with party games and bling bling is right up my alley. What about you? I wish there was time to highlight every booth that was there but I have to focus on the duties that pay the bills. I give props to ever business owner and organization that was there. Click on the links to find out about the professional organizations such as the Hook A Sista Up Collaborative, National Professional Men’s Network, and Grand Rapids Area Black Businesses. I got mad compliments on my I”t’s All About the Curls” tee. My hubby was in even the house. Did you go to the Dream Big Fair? What was your favorite business? Tell me what you think of my report of the event? How can my blog improve? The next event I’ll cover is the Natural Hair GR Meetup – Open Photo Booth Session at the United Institute of Arts this Wednesday. Ya know ya girl loves da camera. Snap. Snap.